Hey buddy, why should I buy anything from you? OK, that’s a harsh way to start a blog post, but, essentially, what value do your products or offerings have to your buyers? Unless you nail that down, any marketing you do is just puffery (and ineffective puffery at that), not really communications. As we continue to dive deeper into value proposition for an upcoming book we’re working on, we see an increased need to help marketers discover what value they truly offer customers. That word – discover – is key. You simply cannot dictate your value to your customers. You have to determine what truly works for them. One of the biggest untapped resources for making that discovery is social media. So in today’s blog post, let’s take a quick look at a few ways you can use social media to help discover your value proposition. And by help, I mean social media will not give you THE answer. But it will help you come up with a few ideas that you can then test which will ultimately lead to your most effective value proposition. The first two can help you discover your value proposition. The third one is basically customer service. Next, let’s get on the same page about exactly what we mean by value proposition. The way MarketingExperiments defines value proposition is – the primary reason why your ideal prospect should buy from you rather than any of your competitors. The great thing about social media is you can be what message board aficionados derisively call a “lurker.” You can passively observe the way your potential customers talk about your overall industry, your specific business, as well as your products and marketing campaigns behind your back. Before social media, most of this information was secret. Someone bragging over a new way to use your product (and thus a new value that you never thought of) over beer at a barbecue. A dissatisfied customer complaining that your competitor doesn’t serve a niche that you fill so well but rarely communicate. Social media has brought all of these conversations out into the open. Set up searches for your brand and product names on Twitter, the same for your competitors, as well as searches about key hashtags and words customers might use to describe a problem your product solves or category your product is in. You can do this manually in Twitter, but more easily in free programs like Tweetdeck or HootSuite. And, of course, paid programs like Radian6 offer even more advanced options. Also note, you might want to try a few variations if your company or product name is commonly misspelled. There are no copy editors on Twitter. For example, the search query I have set up in Tweetdeck for MarketingExperiments is – “Marketing Experiments OR MktgExperiments OR MarketingExperiments” (@MktgExperiments is our Twitter handle, which explains the abbreviation). Don’t overlook Google Alerts. 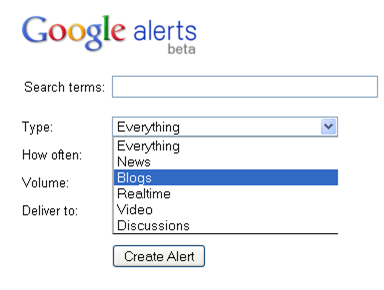 You can set up alerts using the same type of keywords as you did for Twitter in step #1. Pay special attention to the “Type” field. Blogs, video, and discussions can be especially helpful. But the realtime search will likely be of limited value since Google dropped Twitter from that search – which is why the first bullet point is important. Once you’ve lurked enough, you’ve probably got some pretty good ideas for important elements of your value proposition. Yet this is where it can get tricky. By engaging your audience, and this includes everything from actively sending a message out on social media to even just having a social media profile, you can’t help but influence their response. This is known as priming in psychology. You can’t avoid it, but it helps to be cognizant of this effect. So how can you engage…without being overly engaging so to speak? I’ll mention some general tactics in just a moment, but first let’s consider the two-edged sword that is incentives. Freebies, sweepstakes, contests, and the like are an excellent way to increase the amount of feedback you get. Just take the results with a grain of salt. Your respondents may be more interested in the incentive than the offer they’re discussing. The above example shows some passive engagement and the response. But what about active engagement? Zuzia recommends simply asking customers what you want to know. You can do this on your Facebook fan page specifically about your brand. Or, if you’re a B2B marketer, you can use LinkedIn’s Answers feature to ask broader, industry-related questions. Remember, the more active you get, the more you’re priming your audience, and the more skewed your response will be. But at this point, you’re only engaging in qualitative research to get some ideas you wouldn’t have thought of in the four corners of your office. Later, you should test with quantitative research. So what should you do with all of this information? Mandi Frishman, Marketing Manager, Make Me Social, recommends that you structure it around the customer first. She also suggests you document influencers in each market and note suggested conversation topics and tactics. Hopefully, you’ve learned something to improve your value prop. So sit down with a whiteboard and your team and begin to craft some new value propositions. You’re not looking for the perfect phrase. You’re looking for some general ideas that you can further analyze and test. Finally, it’s time to get scientific. Wave goodbye to social media, and use PPC ads and landing pages to actually test your value propositions and get some hard data and quantitative results. This post attracted my attention (I saw your tweet) because of the focus on “discovering why buyers buy from you”. This is the fundamental question that should keep every marketer awake at night. But I’ve spent more than a decade helping B2B marketers gain access to the insights that drive value propositions (and other marketing strategies), and most of the needed information is unavailable through social media. I’ve written an ebook — The Buyer Persona Manifesto — (free, no registration) about the insights that marketers need and how to discover them http://bit.ly/lqEo7B. I’d love to hear your thoughts Daniel. By no means was I trying to say that using social media is the only way to discover your value proposition, simply that it is a way to discover your value proposition. And then, once you’ve crafted some value propositions that you think may be effective, you must test them. Beautifully written, well done. I’m very glad to see a reputable source such as MarketingExperiments to make (yet again) a strong case of psychology and ethnography as an integral part of online marketing. Too many people out there are still push-marketing oriented, and obsess with funny concepts such as keyword density and metadata, and forget to build a webpage for the actual user. As we’ve seen too many times on the MarketingExperiments webinars, there are tons of pages yelling all kinds of stuff to all kinds of people, without sitting down to think things through and create a cohesive corporate persona that speaks clearly to their target audience. In such a climate of quick-fixes and get-there-quickly, Unique Value Proposition is as vague of a concept as it gets. They say “Who cares about quality, right? Just do what J.C Penney did last year, buy your way to the top.” Well… um.. NO, don’t do what JCP did. Instead, get to know your clients, and speak to them in their slang. Otherwise, you may be speaking greek to them. Again, thanks for the lesson, and all the good work you guys are doing.